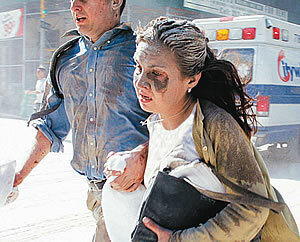 In 2001, jet planes were crashed into the World Trade Center and the Pentagon, injuring and killing thousands. In the days following these attacks—totally unexpected in their timing and method, aimed at the world's only superpower—the world began debating the concept of terrorism that lay behind them. An atmosphere of fear and panic grew, especially in the United States. But that did not last long: Soon the entire world began wondering how best to combat terrorism. No longer could any country stand apart from the fight against terrorism and declare, "Those attacks weren't aimed at us." 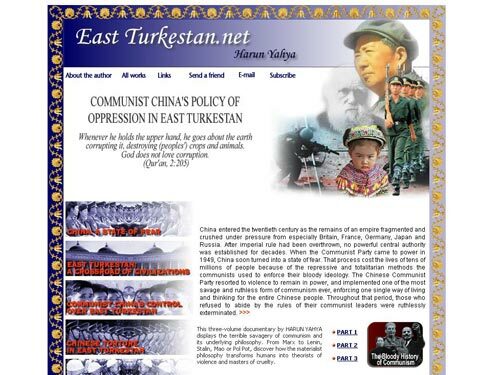 Citizens of every nation realized that the dark face of terrorism could confront them at any time, whether asleep in their beds, while watching television, taking their children to the park or at work in the office. 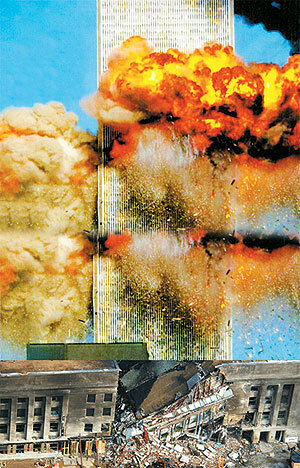 September 11 resulted in the deaths of thousands of people, and in injuries to many more. The terrorists' aim, they realized, was to paralyze society, making civilians reluctant to venture into the street, much less use public transport or go shopping—in short, to create a permanent climate of fear. As soon as America recovered from the shock of 9/11, it joined a large number of other countries to launch a worldwide war on terrorism. From the beginning, however, officials of this powerful coalition declared openly that it would not be enough for them to fight on the military battlefield alone. How should the struggle against terrorism be pursued? To answer that question, we need to identify terrorism's roots. To do so, we must examine the course of the past century, during which terrorism first emerged as a major threat. The 20th century's two World Wars, along with many regional conflicts and various acts of local violence, made it the most bloody century ever. In addition, toward the end of the millennium, constant technological advances only helped terrorists broaden their reach. Now, just one touch of a button could kill hundreds of innocents. High-tech terrorism could inflict billions of dollars in damage on any nation's economy and shape world politics without ever emerging into the daylight. Clearly, after the attacks on New York and Washington D.C. in the United States—the world's greatest technological power no other country can consider itself safe from terrorism or beyond its deadly grasp. Worse still, if the necessary countermeasures are not taken, 21st-century terrorism will grow even more powerful, until one single chemical, biological or even nuclear attack can slaughter tens of thousands. Terrorism is currently costing lives in many countries across the world. In the fight against it, terrorism's ideological foundations must be torn down. To this end, everyone who believes in peace must pull together. 1) Targeting civilians: Any occupied country has the right to resist an army occupying its territory. But if that resistance includes attacks on civilian targets, any justification ceases to apply, and terrorism begins. As we shall see later on in this book, this definition is entirely in accordance with Islamic rules of war. The Prophet Muhammad (may Allah bless him and grant him peace) commanded his followers to do battle against those who declared war on them. But he also ordered them to never regard civilians as targets. On the contrary, it was on order for every single Muslim and that obligation still stands, to take great care to ensure the safety of non-combatants. In the Qur'an, only war for defensive purposes is lawful. A Muslim exposed to an active assault can defend himself against it, but he can never use that as an excuse to attack anyone else apart from the parties engaged in that assault. He cannot attack civilians. Under the laws of Islam, anyone doing such a thing has committed a crime. 2) Destroying Peace: If no state of war exists, then terrorism can also include attacks on military or official targets. Attacks intended to break down peaceful relations between countries or communities are also acts of terrorism, even when aimed at military targets. All attacks that threaten peace, or that are aimed at civilian targets, even in a state of war, are terrorism. There can be no question of defending, approving or justifying such attacks. 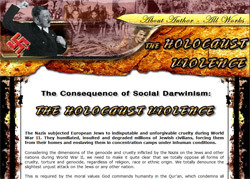 However, such violence is very widespread in the modern world. That is why any war on terrorism needs to be wide-ranging. Its every stage should be carefully planned, with its final aim the total eradication of the entire concept. That, in turn, requires individuals in every nation to totally distance themselves from terrorism. Every form of terrorism must be unequivocally condemned, whatever its causes or aims, no matter what its targets, where it arises or how it is carried out. A devout Muslim opposes both individual and state terror. Similarly, anyone sincerely opposed to terrorism should show the same empathy for the thousands of innocent people it has slaughtered—not only at the World Trade Center, but in attacks in Japan, Spain, East Turkestan, and Indonesia, in the massacre of more than half a million Hutus in Rwanda, in the murder of defenseless people in Palestine, Israel and all across the globe. Once every form of terrorism is fiercely condemned, then no longer will its perpetrators receive support from any country or be allowed to seek shelter inside its borders. Quite literally, terrorists will have nowhere to hide. Before the war against terrorism can come to any definitive conclusion, its underlying philosophy must first be identified, along with the means to be employed. This book, therefore, deals with terrorism's basic starting point, as well as the disasters to which it leads. Its starting point is the assumption that violence is a virtue in itself and a powerful means to solve social or political problems. When killing innocent people, damaging public order and disrupting peace, a terrorist acts under the influence of ideas that have been imposed on him, encouraging him to believe that he is engaged in a justified struggle. Terrorism can be resolved only when such people understand the mistaken logic of any ideology that inspires terrorism and incites to violence, and when they realize that going along with it can never get them anywhere. Until those ideologies' errors and contradictions are exposed, all measures taken against terrorism can be short-term only. 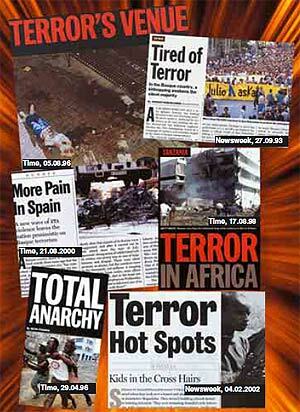 Soon terrorism will emerge again, in different places and under different circumstances and wearing a different mask. We can put an end to terrorism only by destroying its ideological infrastructure. In later chapters, you will see that modern terrorism's ideological foundations in fact go back to Social Darwinism and the materialist tendencies derived from it. Due to a distorted mentality, people exposed to this indoctrination believe that life is a field of struggle and that only the strong survive. Due to that perverse mentality, the weak are condemned to be eliminated as man and, in fact, the entire universe, are both products of chance. Therefore, no one is responsible for his actions to anyone else. These and similar ideas inevitably encourage people into leading an animalistic form of life, where ruthlessness, aggression and violence are regarded as acceptable or even virtuous. Anyone who resorts to terrorism, maintaining that violence is the only way to achieve his aims, is actually under the influence of Social Darwinism and materialist thought, no matter what his religion or race, or what group he belongs to. 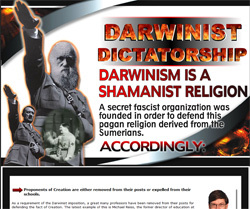 Modern terrorist groups that claim to act in the name of religion are also under the influence of Darwinism and materialism, even though they claim to carry out their terroristic acts in the name of religion. This is because it is impossible for anyone who lives by the morality of religion revealed by Allah to approve of violence of any kind, much less achieve a "higher" aim by murdering others. Those who resort to such methods are therefore pursuing the exact opposite of the moral values upheld by religion, carrying out their actions under the influence of materialist ideologies. 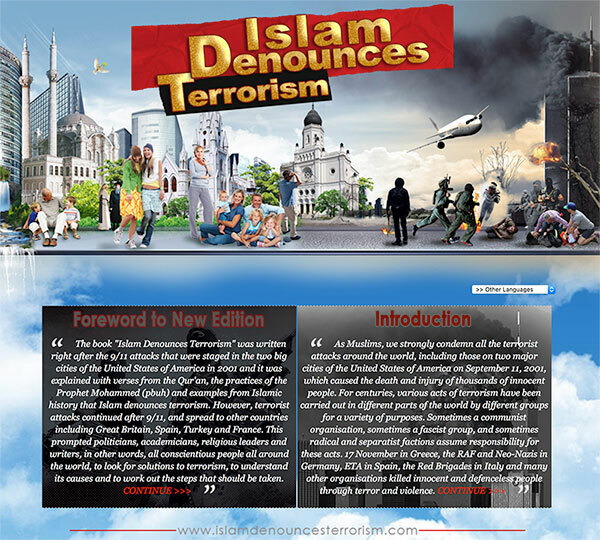 In Islam Denounces Terrorism, it was made clear that Islam fiercely rejects all forms of terrorism, no matter whom it may be directed against. In the light of verses from the Qur'an by Allah, it was explained how religious morality calls people to peace, understanding and convenience. Also stressed was the dishonesty of condemning only those acts of terrorism directed against one's own side: such an attitude only weakens the fight against terrorism; and anyone living by Islamic morality needs to fight terror in all its all forms. The foundation of that intellectual struggle is based on revealing the true morality of religion. Today's politicians, political commentators and academics agree that by itself, military force is not enough to root out terrorism. 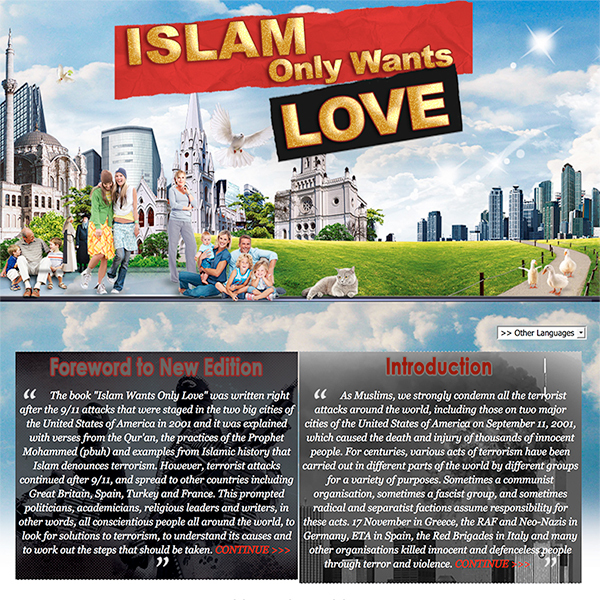 This book concentrates on the only way it can be eradicated: by means of peace, compassion and love. All the divinely inspired religions that Allah sent down by means of His messengers are helpful guides. 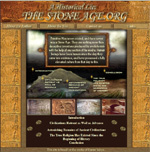 This book offers examples from the Qur'an as well as from the Bible (The Torah and The Gospel gradually became corrupted. But various sections compatible with the moral values of Islam were still preserved.) 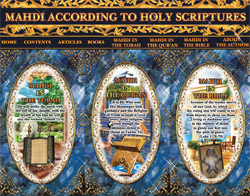 to show how each of the three divine religions forbids the use of unjust violence. 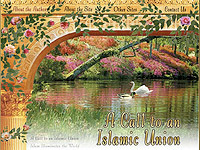 It also gives examples to show that the only way to fight terrorism is to heal its root causes through the love, affection, compassion, humility, forgiveness, understanding and concepts of justice that religious morality instills in people—whom, following the verse from the Qur'an:"Allah calls to the Abode of Peace... " (Surah Yunus: 25) Such people will do their utmost to build a world full of peace and love. command what is right, and turn away from the ignorant. Let there be a community among you who call to the good, and enjoin the right, and forbid the wrong. They are the ones who have success. 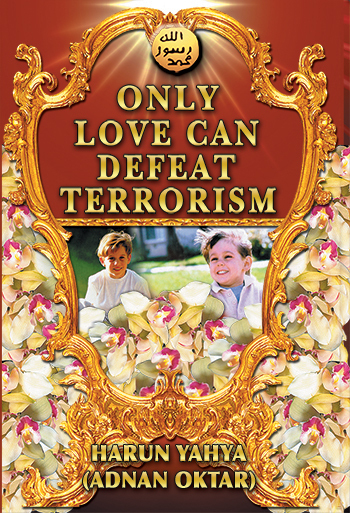 You can read Harun Yahya's book Only Love Can Defeat Terrorism online, share it on social networks such as Facebook and Twitter, download it to your computer, use it in your homework and theses, and publish, copy or reproduce it on your own web sites or blogs without paying any copyright fee, so long as you acknowledge this site as the reference.